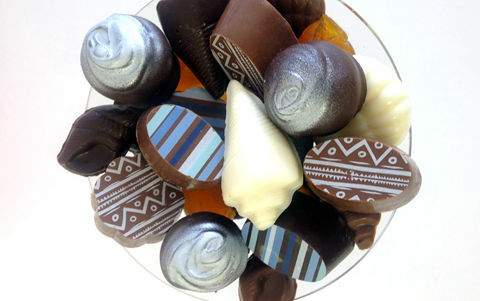 Welcome to Sweethearts Three, the only candy store in the Boston area producing delicious handmade kosher chocolates. Sweethearts Three has been sweetening the lives of our customers since 1981. Located in Sharon, Massachusetts, we've been producing handmade, innovative chocolates for a variety of occasions from birthdays and anniversaries to weddings and bar/bat-mitzvahs to Passover and the High Holy Days. We prepare chocolate assortments or candy trays (Shiva trays) for houses of mourning. We specialize in corporate gifts holiday time or any time, from customized chocolate towers, to candy-of-the month packages, to edible candy baskets. We use the finest ingredients to prepare our handmade kosher chocolates - pure milk, bittersweet and white chocolate, jumbo cashews and pecans, succulent glazed fruits. This mother-daughter team provides personalized service, offering creative ideas and confection perfection for any occasion. People have enjoyed our chocolates at events both nationally and internationally from the Breeders' Cup in Louisville, Kentucky to a bar mitzvah at the American Embassy in Tokyo, Japan. Some of the local organizations that have used our chocolate include Boston College Dining Service, Hebrew College, The Hebrew Rehabilitation Center, The Jewish Theological Seminary, and The Maimonides School. We work directly with caterers, party planners, and hotel banquet directors to incorporate chocolate into their clients’ events. 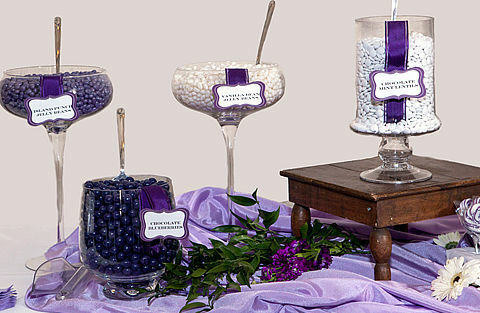 We have thirty years of experience in this area, from one-of-a-kind chocolate centerpieces to unique party favors to hotel "welcome" bags to Candy Bars and candy buffet tables. Customization is the key to our craft. Everything is made-to-order and is prepared at our shop with customers' dietary or allergy concerns in mind. We offer ideas on how to incorporate chocolates into themed parties and recommend candy that will distinguish your event from every other event. What’s more, we offer a wide array of options to fit any budget. Our chocolate is 100% kosher and available in either pareve or dairy. All ingredients used in the creation of our confections are kosher, too. We are licensed by the Rabbinical Council of New England and our products are certified kosher under the Orthodox supervision of the Vaad Harabonim of Massachusetts. 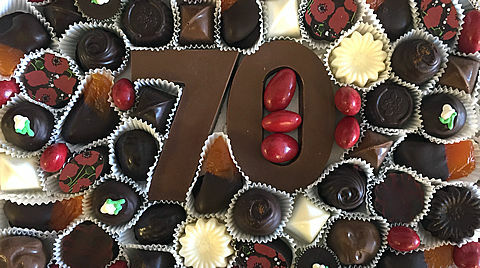 In 2001, we successfully added our exclusive line of kosher for Passover chocolates, making us the only company in the Boston area producing handmade chocolates for Passover.